Asian Handicap Betting: What is Asian Handicap Betting? Which bookmakers offer Asian Handicap Betting? Asian Handicap betting is a method of betting which can be utilised across a range of sports although particularly popular for football betting. Asian Handicap betting essentially attempts to equalise the differences between the strength of respective opponents. This should in theory level the playing field from a betting perspective between two opponents. Generally the favourite would be negatively handicapped by a margin (say a number of goals in a football match) and the underdog given a positive handicap to equalise the event to as close to 50% chance of happening for each outcome winning the handicap as possible. The Asian Handicap market thus attempts to create a 50-50 contest by handicapping each opponent appropriately. An Asian Handicap can be negative or positive and in theory a favourite could be positively handicapped although clearly the appetite for such a bet may be restricted given the corresponding low odds and low returns. The handicaps can range from say a quarter goals to up to three or even four goals. For half goal handicaps (0.5, 1.5, 2.5, etc) there will always be a winner as clearly it’s impossible to score half a goal. For whole goal Asian Handicaps of course there will be occasions where the result means the stake is refunded as the handicap has been cancealled out. Asian Handicap betting is particularly suited to football betting as Asian Handicap betting essentially removes the draw outcome or at least makes it work for you one way or the other. Given around 25% of games end in a draw this can be an attractive feature for punters who get frustrated by the draw. 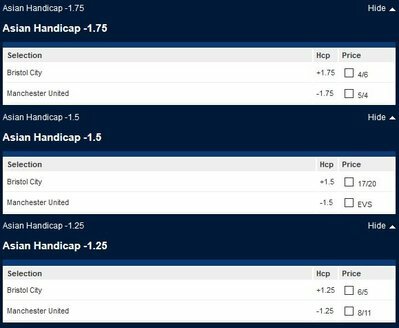 Asian Handicap betting is somewhat of a niche area of betting in the UK, although it’s getting more popular and a higher profile as punters cotton on to it, realising it’s a fun way to bet and offers good betting value. If you fancy an underdog to perform better than expected, utilising an Asian Handicap bet can be a good way to bet. You don't necessarily have to pick the exact correct outcome (win, draw, win), but rather the correct direction of the result based on the Asian Handicap odds. The vast majority of major UK online bookmakers now offer a multitude of ways to bet on Asian Handicaps. Asian Handicap betting is a great way to place bets on sports. This guide will give you all the information, know how and guidance you need to make the most of of Asian Handicap betting!